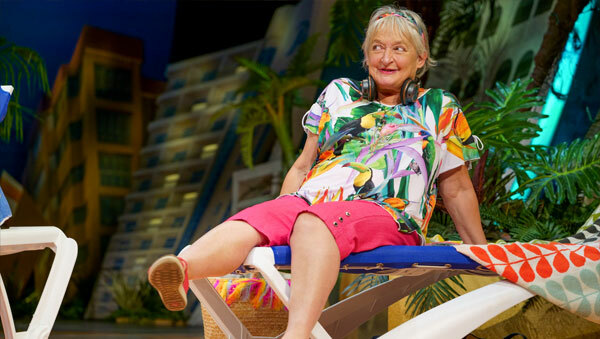 Rid those January blues at Sunderland Empire this month when Benidorm Live checks in for one week only, 14-19 January 2019 for a dose of fun in the sun! Derren Litten’s smash hit ITV comedy BENIDORM is set to bring sunshine and smiles to the stage with Benidorm Live and all your favourite stars from the Solana Hotel including Jake Canuso (Mateo), Janine Duvitski (Jacqueline), Sherrie Hewson (Joyce Temple-Savage), Shelley Longworth (Sam), Tony Maudsley (Kenneth) and Neptune’s very own Asa Elliott. Derren Litten has now written an all new set of Alicante escapades for the much-loved cast members as they swap sangria for the stage – after a quick spruce up at the Blow ‘n’ Go!